Are you familiar with Ukraine's folk musical tradition? If not, you're in for a surprise! According to the UNESCO, Ukrainian folk music is not only extremely melodious but also one of the richest in terms of its heritage. It is comprised of more than 200000 songs. Ukrainian is considered by experts to be the second most melodic language in the world after Italian. All this is probably news to you, but that's not all. 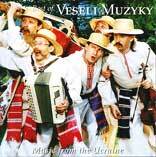 Veseli Muzyky will help you to discover for yourself some of the many faces of beautiful Ukrainian folk music and culture. V. M. is a folk music ensemble, consisting of six brilliant musicians: Pavlo Bugar - woodwinds, vocals, Yuri Bilak - cymbollum, Vladislav Potchko - violin, vocals, Yuri Risol - percussion, vocals, Sergiy Khitnakov - accordion, vocals, arranger, Alexander Chukh - bass, vocals. In 1983, five talented musicians fresh from the Kiev Pedagogical Institute decided to play together. Soon, the group acquired a following in Kyiv and later throughout Ukraine. 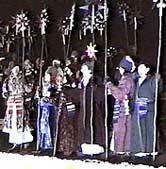 In 1987, they took first place in the All Ukrainian musical contest. In 1988, new artist joined the group - the cymbollum virtuoso, Yuri Bilak. In the same year, V. M. were admitted to the Ukrainian Philharmonic Society and named best folk group of the year. The ensemble has been touring extensively abroad with considerable success since 1986: the Czech Rep., Slovenia, West Berlin, Poland, France, Bulgaria, Spain, Finland, Great Britain, Germany, Russia, USA and Holland. Their repertoire includes a number of popular songs and instrumental pieces together with the authentic folk tunes, original arrangements of popular Ukrainian songs and musical tunes from various parts of Ukraine.